You will be given a reference e-book to read which has 341 pages And the test will be based on that e-book , you can take final test within 1 year of purchase. Public relations (PR) refer to a kind of practice which involves the management of the proper flow of information or data between individuals or business organizations and the general public. This practice gives different individuals and business organizations the chance to gain exposure to their target audience or market with the help of those topics that are of great interest to the general public and news items that do not involve any direct payment. One of the major aims of public relations is to easily persuade or encourage partners, investors, employees, stakeholders and the public to maintain a specific perspective regarding a company, the kind of leadership that it follows, its political decisions and its products. Learning everything about the public relations practice is a great advantage especially if you are running a business or you want to deal with people and any other organization which can help you achieve success. This is the main reason why taking part in the public relations certification program from Brainmeasures is a wise move for you. Brainmeasures has proven to the public that it is capable of supporting their need to learn with all the professionally and expertly developed online certification courses that it offers. Its public relations course is also created in such a way that the people who decided to take part in it will have an easier time understanding all the complex concepts, methods, principles and issues behind it. With the help of the Brainmeasures public relations course, you will get the chance to understand all the strategies and tools that are now used in the practice and determine exactly how you can use them to your greatest advantage. With Brainmeasures, you will get the most comprehensive public relations training and this is also a major help in honing your skills in speaking and communicating confidently to a large crowd. Before you will receive your hard copy certificate in this field, make sure that you successfully pass the public relations exam as this will serve as an assessment of the level of your knowledge and skills in the industry. 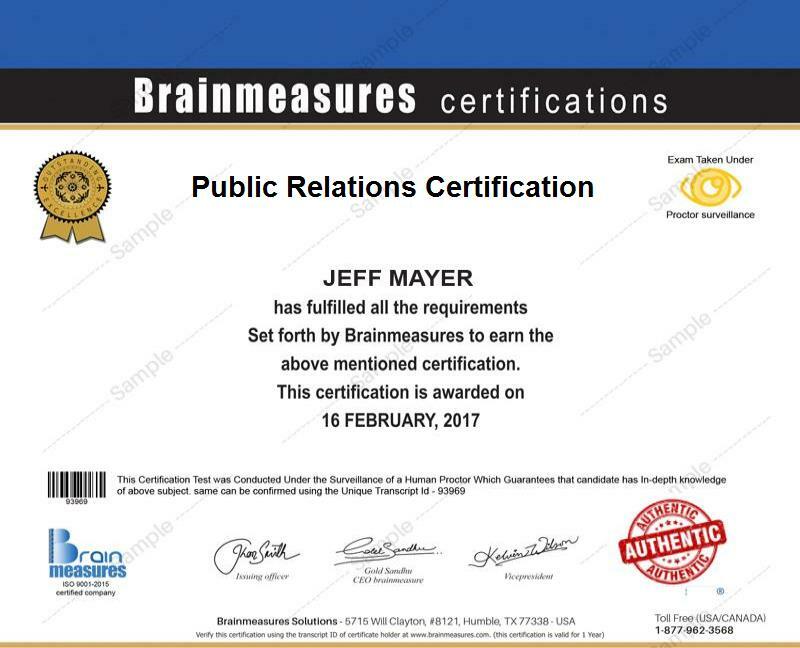 The public relations certification program offered by Brainmeasures can benefit different types of individuals, professionals and business organizations. This is a suitable program for professionals in the marketing, communications, e-commerce and public relations industry who wish to incorporate various social media channels in their marketing campaigns. The public relations certification program is also ideal for small business owners, public relations practitioners and any other individual or professional who wish to enter the public relations field with a higher level of skills, knowledge and expertise about the industry to increase their chances of achieving success. As a public relations certification holder, you can also anticipate a sudden increase in the level of your income. Annual salary for public relations experts can range from $52,000 to $160,000 depending on the position that they hold. If you are a public relations certification holder, then note that the specific location where you practice your profession can have a great impact on the amount of salary that you receive. Highest paid PR experts are those that work in metropolitan areas such as San Jose, California, Washington, D.C. and Victoria, Texas.